Barcelona coach Ernesto Valverde has revealed that he will make changes and rotate his squad this weekend ahead of their clash with Man Utd. The Catalan giants face Huesca in La Liga on Saturday afternoon, as they hope to take another big step towards defending their domestic crown. Valverde’s side boast an 11-point lead over nearest rivals Atletico Madrid with just seven games to go, and so a win over bottom-of-the-table Huesca will edge them ever closer to another major trophy. Given the struggles of their opponents this season, coupled with the fact that it’s sandwiched in between the two legs of their Champions League quarter-final tie against Man Utd, it seems like a sensible time to rest players. 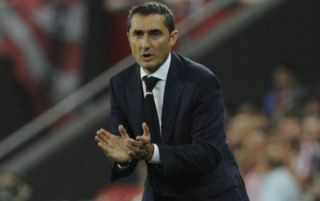 As per his comments in his press conference on Friday, Valverde has suggested that he will do exactly that in order to ensure his preferred line-up is refreshed and ready to face the Red Devils. Barcelona hold a slender one-goal advantage from the first leg at Old Trafford, and so the tie is very much alive still which would make the decision to rest key individuals all the more sensible. Lionel Messi could be one star name missing from the starting XI, as the Argentine suffered facial injuries following a collision with Chris Smalling, and Valverde has specifically suggested that he will rest the 31-year-old. However, there could be opportunities for Samuel Umtiti, Ousmane Dembele and Jean-Clair Todibo to start, with Dembele in particular hoping to prove his fitness after an injury setback in order to face United next week which would be a huge boost for the Spanish giants given his pace, movement and eye for goal adds a different dynamic to their attack.